Grammarly is a global IT-company with offices in San Francisco, New York, and Kyiv. The Company offers an AI-powered product that helps people make their English communication clear and effective, wherever they type. Grammarly operates 24/7, with the extensive use of IT devices and a high volume of communication and data exchange, both within individual and group settings. The design of the office began with the selection of the location for lease. We carried out approximately five sketches of different buildings and after that offered four variants of the already selected premise. In 2016, the Grammarly Kyiv team grew and decided to move to a bigger space. 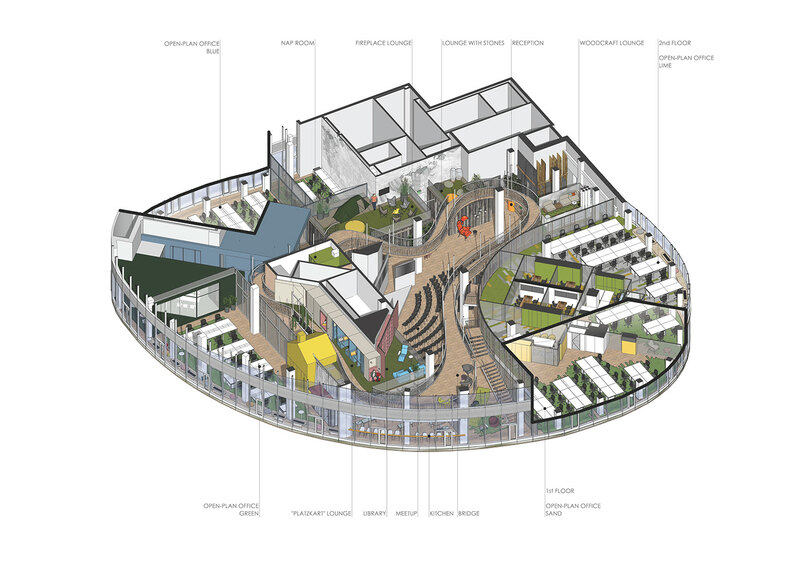 Due to the nature of operations, the Company required a variety of spaces for different activity types, including a large meet-up zone with 150 seating capacity, for lectures and presentations; a number of small meeting rooms equipped with IT devices for quality audio and video conferences between offices across the globe; a soundproof recreation room; canteen for employees; several lounge zones; nap room; reception zone and facilities areas. To contribute to the highest level of the Grammarly Kyiv team comfort and efficiency, other requirements included eco-friendly materials, warm color palette and homey feel of the interior. 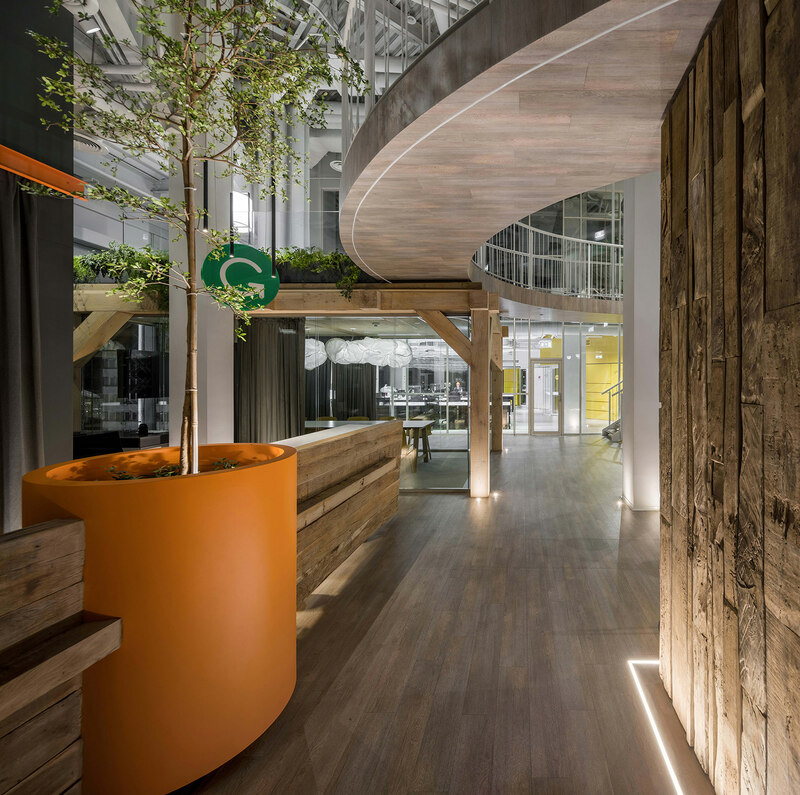 A positive work-life balance for the employees was created by the extensive use of natural wood, including creative reuse of oak throughout the office space, multiple references to the outdoors in the lounge areas, and the abundance of natural light. 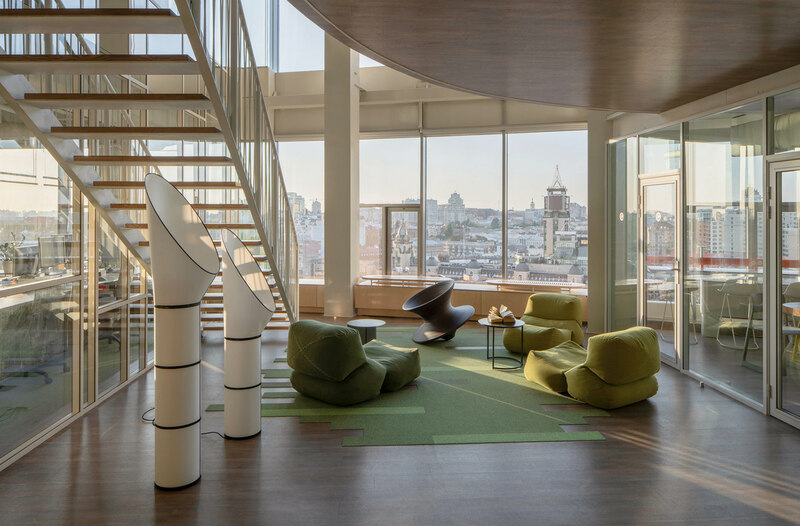 Grammarly’s office occupies two-level floor of the 14-storey business center in Kyiv, with 1300 sqm of the floor space on the lower level, approximately 450 sqm - on the mezzanine level, and the ceiling heights of 3 – 8.8 m respectively. 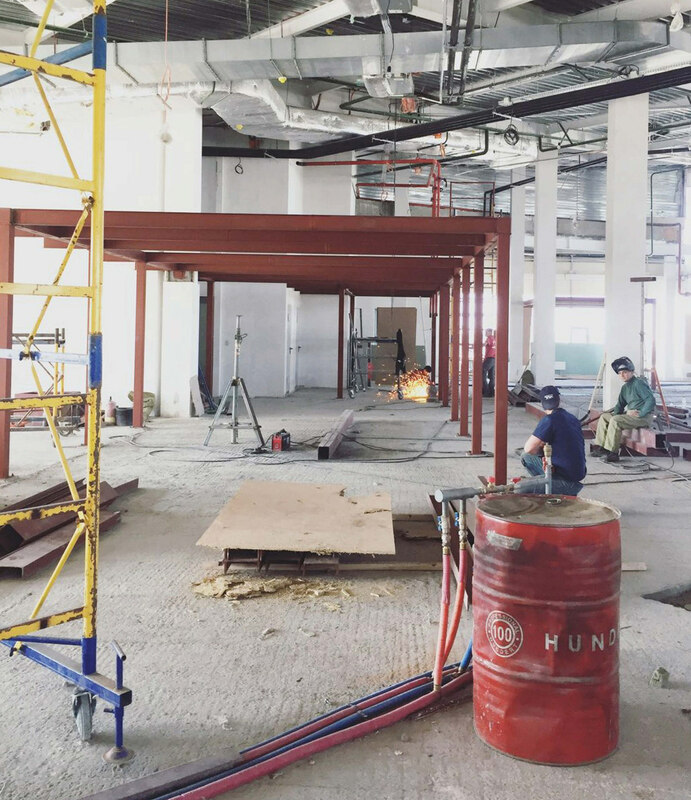 Mezzanine-level configuration corresponds to the radial line that separates working areas from the conference hall. The two levels are connected with the open staircases. On top of the lower-level ceiling are lounge zones that are connected to the working zones by a catwalk ring bridge. 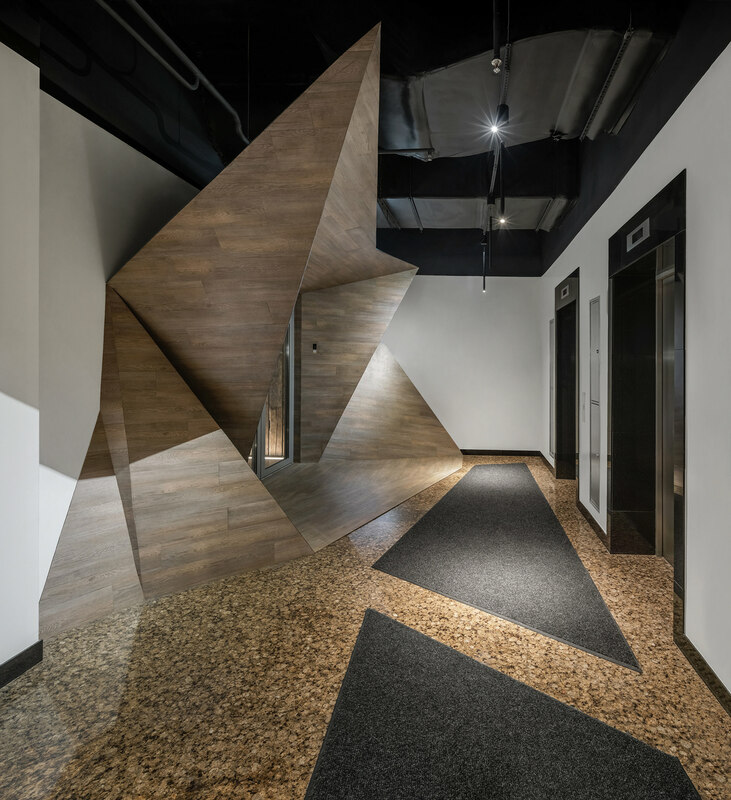 Relying on the demands of the business center to not change the walls finishes, the architects designed the propped structure of the entrance group resembling a fragment of the cliff. The design process began with the need for a ramp that would leading to the office and grew into a whole design composition. Meeting at the entrance, it immediately hints at the dynamics of the office space. Attached to the one of the walls, a large motion-activated mirror welcomes and farewells you with the words "write the future" that appear and disappear. The reception desk is made of solid oak timber and includes a large flower pot holder with a 4-meter tree. To make the reception area more functional, we designed a floor-to-ceiling storage rack with a rolling ladder to reach the top shelves. Our layout idea was to split the office area into six open-plan working spaces, each with soundproof qualities and finished in different colors. Within each workplace, there are two meeting rooms with capacities of 8 to 15 people. Designed specifically for the client, a custom-made Skype booth is an autonomous, soundproof room for two people, with a wall mounted folding table and a lighting for private conversations. Compositionally, it is a box with a light-transparent angle and precise geometry. Sound absorbing fabric panels are placed around the perimeter of the room. It has CO2 based ventilation system and air conditioning, fire systems, which all connect through the raised access floor. Skype-booth boxes are located in every workspace. G-table is a custom table designed together with the clients to satisfy the needs of the employees. Being a minimalist transformable table, it has It has built-in valves for chargers, cables, and stationary boxes. The valves can be installed in the random order, replaced or removed. Each of the yellow meeting rooms accommodates the transforming tables which can unite separate meeting spaces into a single common area. Woodcraft meeting room is executed in the form of a prefabricated timber frame, with the engineering communications hidden behind the ceiling.